The Department of State on Tuesday left open the possibility that Iran could partially fund international inspections of its own contested nuclear sites, raising concerns that the Islamic Republic is being given too much control over the implementation of the recent deal reached with world powers. John Kirby, a spokesman for the Department of State, declined to answer multiple questions about how international inspections of Iran’s nuclear sites would be paid for by the International Atomic Energy Agency (IAEA), which is requesting at least $10 million to carry out the work. The United States will likely fund some portion of the cost, and Kirby left open the possibility that Iran could also foot some of the bill. The matter has been the subject of much speculation in recent days after it came to light that Iran would be permitted to inspect its own nuclear sites, raising the possibility that Iran could continue to hide nuclear weapons work. "I don’t have any specific funding contributions to speak to today in terms of amount," Kirby told reporters. "We’re still working our way through that. I do want to add that we have every intention to continue to contribute to the IAEA for the purpose of this—doing this very important work of the verification of Iran’s nuclear-related commitments." "I won’t speak for Iran," Kirby added. "I don’t know what, if any, commitments Iran has or will engender under this, but we’ve—as we noted in the statement, we’re committed to working with all the member states to ensure that the IAEA has the resources that it needs." When pressed to explain whether the United States would pay for Iran to inspect its own nuclear sites or press the Iranian government to foot the bill, Kirby demurred. "Honestly don’t have a specific answer for you in that regard," Kirby told reporters. "I mean, again, we’re going to contribute—continue to contribute to the IAEA and their funding needs specifically as it relates to this deal. And it’s not just us; we want other member states to do it as well." "I’ll let Iran speak for itself in terms of what, if any, contributions it plans to make," he added. "But I don’t know that I would characterize the funding resources applied to IAEA and their need to do this work as sort of then paying for any efforts done by Iranian officials to meet compliance." Matthew Lee, a reporter for the Associated Press, continued to question Kirby on the issue. "Well, I mean, someone’s got to pay for it," Lee said. "They’re not going to work for free, whoever they are, whether they’re Iranians or they’re from Djibouti." "Well, I’m assuming many of them are government—work for the government of Iran," Kirby responded. 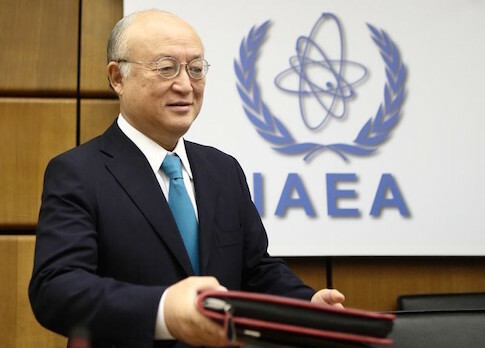 Yukiya Amano, the IAEA’s director general, warned on Tuesday that the agency is in dire financial straits and will run out of money later this year. "The Agency has immediate funding needs related to the continuing costs of implementing monitoring and verification under the existing Joint Plan of Action," Amano was quoted as saying. "The extra-budgetary contributions which we have previously received for this purpose will be exhausted by the end of September." The State Department would not address a request for comment seeking further information about future funding for the IAEA, directing a reporter to call the IAEA directly. One senior official with a pro-Israel organization criticized the administration for failing to take the funding issue into consideration before inking the deal. "In the last few weeks we’ve learned that the Iranians will be inspecting themselves at some sites," said the source, who is involved in the fight over the deal. "Now the administration has opened the door to the Iranians literally paying the salaries of the people who will be inspecting them at other sites." "That may or may not happen, but it’s revelatory that the White House cares so little about the nitty-gritty of the inspection regime that they didn’t even bother thinking through these questions," the source said. "They just want this out of the way." The funding issue comes amid new revelations that Iran could be permitted to conduct its own inspections of the Parchin military complex, one of the country’s most disputed nuclear sites. "Thanks to the Associated Press story, the public now knows that Iran, one of the worst nuclear proliferators in history, will be allowed to inspect itself at the Parchin military facility," said a senior Republican congressional source. "While the Obama administration had initially refused to publicly confirm or deny Iran’s self-inspection at Parchin, now it’s doubling down and embracing this charade of nuclear verification, and holding open the possibility that the American taxpayer will help pay for the charade," the source said. Iran also has revealed in recent weeks that the United States is banned from knowing the details of its nuclear inspections agreement with the IAEA, a disclosure that prompted anger among many U.S. lawmakers. Iran has gained additional leverage over the IAEA by refusing to sign a document known as the Additional Protocol, which is meant to force Iran to disclose certain details of its nuclear program to the IAEA in order to confirm that Tehran is not operating a clandestine weapons program. This entry was posted in National Security and tagged International Atomic Energy Agency, Iran Nuclear Deal. Bookmark the permalink.